Ancient Marmaris, Physkos, was an important stage on the Anatolia-Rhodes-Egypt trade route. In the 16th century Suleyman The Magnificent had a citadel built on a hill, the remains of which can still be seen today. Swimmers should not miss Ataturk Park, to the east of Marmaris, where a shallow beach, extending to the bay leads to safe waters. The clear sea is warm enough for swimming from early May until late September. Marmaris also has horseback riding and tenis centers for the sports enthusiast. This is one of the heady aroma of the frankincense tree. Weekly ferry lines run between Marmaris and Venice during the summer season. Near Marmaris, at Icmeler, the hazy mountains of the interior slope down to sandy beaches. Under blue skies, the clear sea is ideal for all types of water sports. Many find this area so irressistible that they stay longer than orinally planned. And there are some excellent accomodations here, in which you can prolong your contact with nature. As you drive down from the high mountains into the village of Turunc the scene opens out onto the spectacular blue waters beyond the natural harbour. The village itself is small and scattered around the bay. Most of the restaurants border the beach. A few bars and restaurants farther back from the water's edge offer fresh fish and superb views. Kumlubuk, a turquoise paradise, lies on the southern side of the bay. On the northern side , above the water, stands the ancient Rhodian city of Amos. Loryma, at the tip of the Bozburun Peninsula, where the ruins of the ancient harbour and castle remain, can only be reached by boat. Natural quiet bays and scattered islands punctuate the northern shore of the peninsula, ideal for those who want to get away from it all. Situated within 3-4 hours drive from Marmaris are three sites of the seven Wonders of the ancient World. The Artemisium at Ephesus, the Mausoleum at Halicarnessus and the Colossus of Rhodes. 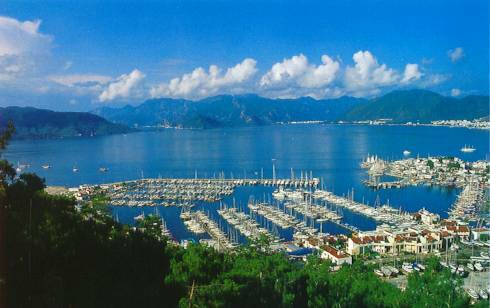 In ancient times Marmaris (Physcos) was part of the Kingdom of Caria bordered by the Kingdoms of Lycia and Lydia. Homer was born just north of Smyrna, and he recorded in the Iliad, thye heroism of the Carians in the Wars of Troy. The Carian people came from the Crete around 450 B.C. and took over Physcos in 340 B.C. Six years later Alexander the Great conquered Caria. From about 300 B.C. the area was ruled by Egyptians, Assyrians, Ionians and Dorians successively until in 138 B.C. when Physcos was ceded to Rome and governed from Rhodes by Roman Generals. It was not until 1425 AD that it became part of the Ottoman Empire. In 1521 Sultan S�leyman the Magnificant commisioned the building of Physcos castle which was to be used as the headquarters for his army prior to attacking the Knights of St.John in Rhodes. At that time there lived a wise, wholy woman named Sariana(Blond Mother). The Sultan asked her opinion on the result of the forthcoming battle and she wisely foretold that he would win. The sultan did win amd the Crusaders were sent off to Malta. The Tomb of Sariana may be visited, set beside the mosque on the hill behind Marmaris. Even today local woman prey here and ask for guidance. On this peninsular there are the sites of 12 ancient towns and a drive through this unspoilt area brings you to the remains of ancient civilisations and Turkish villages, little changed over the centuries. Within the vicinity there are some lovely unspoilt fishing villages to be visited such as Selimiye, S�g�t and Orhaniye. Loryma (Bozukkale) with its castle ruins is only accessible by sea and is set on the south western point of the Marmaris Peninsular. Once populated by the people of Rhodes as it was a safe harbour for the Greek navy. Hydas with a Hellenistic wall and graves is situated on the west of the Marmaris peninsular in Selimiye. Castabus with the remains of a temple and a theatre was a cure centre and famous for its goddess HEMITHIA. These ruins are to be found above the village of Hisar�n�. Erine the name derived from �Saint Irene� is hidden away in the woods. Some Roman ruins are to be seen although as yet this site is unexcavated. Situated near Hisar�n�. Buthenna (Euthenna) with some castle ruins set on a mountain called �Alt�nsivrisi� 600m high. An easy climb from Karacas���t village. Bybassios where the ruins of awall can be seen in the woods as well as an antique fortress set on a small island nearby. Situated near Orhaniye on the road to Erine.